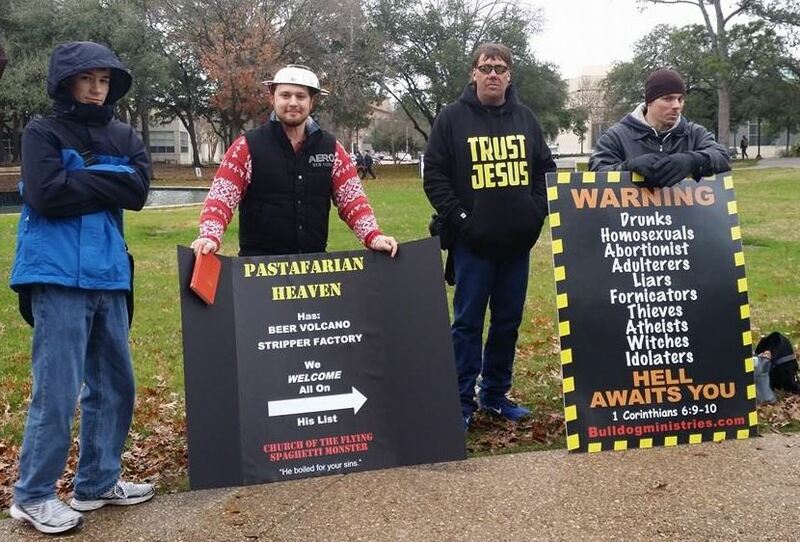 Pastafarian Minister Dan Scott spotted a couple of campus ministers preaching the Gospel of Jesus Christ (in a less than tolerant tone) in front of the University of Houston, so he decided to do some evangelizing on behalf of the FSM. Judging by their faces this looks to have been a great success in church-to-church interaction. I’m pretty new here, so, who can tell me more about Pastafarianism? (probably spelled wrong). I’m moving to New Zealand next year, are there any events happening there? And how active are they? Probably the best introduction to Pastafarianism is to go to the fountainhead. There is an “about” section on this website. Silly Kiwi Man may be able to answer your questions about how active people are in New Zealand. 4) Believe that the assertions from a bunch of unknown authors writing nearly 2000 years ago in places that can not be determined are of any importance to people living in the 21st century. PS: Yes, I know that saying the 21st century confirms that we still use “BC” and “AD”. So what? I have no idea why you are here, Jason, but, if ignorance of ‘big questions’ is what you call god, beware, because your god will keep diminishing. Can you name a single phenomenon, in the whole of human history, that used to have a natural explanation, but, now has a supernatural explanation? Wagwan, we have been studying your religion for our sociology project. Shoutout to Jim Bruce Davis for helping us with our research. Absolute unit!